In the first two parts of this series published over the past fortnight, we discussed some of the challenges investors face to generate returns and passive income in the current environment of low interest rates. One possible solution to supplement investment income is to make the transition from investing to trading. This week, we will discuss the most vital component of trading which is the use of Risk and Money Management within a Trading Plan. To recap, traders aim to take advantage of the short-term price fluctuations that are mostly ignored by the investors who generally take a longer-term approach to markets. As a trader, the aim is to buy a security at a lower price and then to sell it at a higher price or by short selling which involves selling a security at a higher price and buying it back at a lower price. And therein lies the problem. A lot of new traders think only in terms of the money they can make from trading. Rarely, if ever do they think about how much they can lose. This contrasts with the approach of professional traders, who think about how much they can lose, every time they trade. Each trade is treated objectively, and they avoid becoming emotionally attached to any single trade. To facilitate this mentality, professional traders follow a Trading Plan, much like the business plan you might have followed to achieve business goals and success in your chosen profession. It is logical then to apply the same discipline from your chosen profession into trading and this comes from having a Trading Plan. Like any good plan, a Trading Plan pre-determines what you are going to do before you have to do it. It is the difference between having control over the outcome or being controlled by the outcome. A good Trade Plan includes rules for trade setups and entries, profit targets, stop losses, position sizing, as well as Risk and Money Management. The latter of which is probably the least understood and most commonly neglected by private traders and one of the key reasons attributed to the high failure rate of new traders. Vital to Risk and Money Management is the use of stop losses. A stop loss protects a trader when the market doesn’t do as expected. It is important to remember losing trades are a part of trading and despite what you might hear on social media and on other forums, no single trader gets every trade right, it just doesn’t happen. Because my trade entries are supported by Technical Analysis, it makes sense to exit a trade for technical reasons, hence the location of my stop loss will be at a point where the market has moved against me and the technical reason for the trade is gone. Also crucial is deciding in advance the amount of money I am willing to risk on any one trade. As a guide, I aim to risk no more than 1% of my account value per trade. In theory, this means if I am trading a $10,000 account then $100 is the maximum I will lose if I am stopped out. While this may seem like a trivial amount, its very important to understand the context and mathematics behind this decision. I hear of many new traders who might start with a trading account of $10,000 and who then decide to risk $1,000 per trade. What they don’t realise is, if they were to have a run of five losing trades in a row which is possible, it equates to a 50% drawdown. To get the trading account back to $10,000, requires a doubling of account equity or a 100% return just to recover!!! 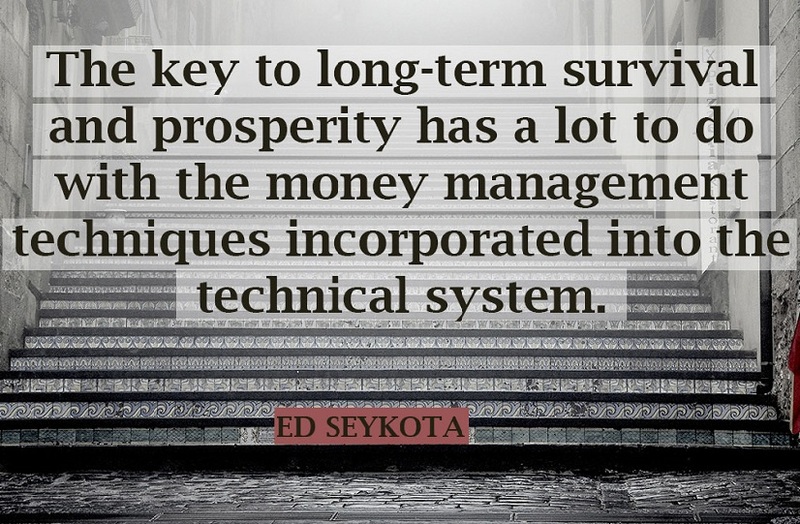 As the quote below from famous trader Ed Seykota reminds us.